Converge Solutions Inc (Converge) is a Caribbean company specializing in the use, application and integration of information and communication technology – (ICT) for the benefit of improving our customer’s business performance. The company’s background is steeped in the telecommunications and information technology background of the founders Bernard Smith and Terrence Elliott, but built on the culture of studied and sustainable change for growth and development of the industry within which they have nurtured and participated throughout the Caribbean. Collectively with over forty years of experience in the telecommunication and information technology industry, Converge’s strengths emanate from our first-hand knowledge, insight and vision of the evolution of the industry across markets and within segments. We are confident that with our over 40 years of telecommunication and I.T. experience, along with a helpful, dedicated and well trained staff, we are the most ideal candidates for all your technological needs. We at Converge Solutions Inc pride and hold ourselves accountable on providing the best customer service to our customers. We invite you to notify us should the service is sub-par. We pride ourselves on providing prompt and dedicated service to alleviate whatever hardware and software issues your company’s may be currently experiencing. We do and provide you with the research we have done to find the latest and most recent innovations to maximize your efficiency of your daily business operations. To become the leading Caribbean based solutions provider supporting Caribbean enterprises to achieve their competitive advantage and business goals through skillful adoption and application of ICT solutions within their business operations. To be our customers’ preferred partner in providing value generating solutions through Information and Communications Technology for their organization, while providing career development opportunities for our team in a mutually beneficial and gratifying inclusive culture of productivity. People centered employer. 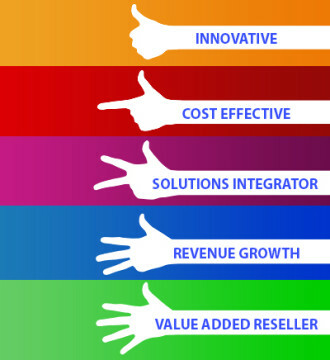 Customer centric service partner, delivering added value for the improvements in enterprise, community and citizenry.